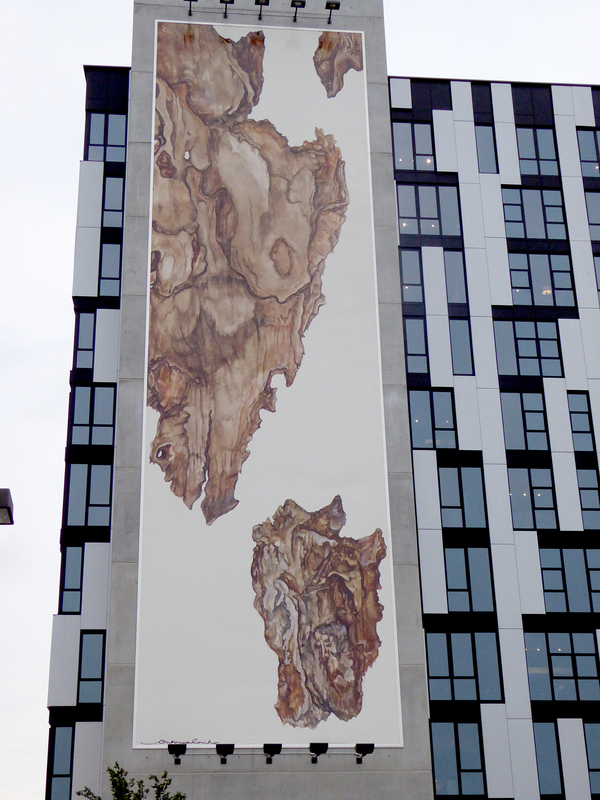 Last night was the official unveiling of Antonia Contro’s artwork “Scorza” on the façade of the 1611 West Division condo building at the corner of Division and Ashland. The ninety-two-foot-tall, twenty-seven-foot-wide digital print is the first “art wall” sponsored by Intelligentsia coffee bar, which will be opening a new location in the building on July 17. In a phone conversation this morning, Intelligentsia’s director of communications Stephen Morrissey described the company’s long-held commitment to community with particular emphasis on art. Not only have their other locations played host to café art installations on rotating exhibition schedules, but they have previously partnered with Chicago organizations like the residency program ACRE, the Chicago Artists Coalition and Mana Contemporary with donated coffee and coffee bars. Morrissey sees this new public art program as the next big step in the ways their company supports the arts.